This blog is about my first attempt at a garden. I'm getting a lot of help from more knowledgeable people and I thought I'd share my experiences, successes, and not so successes. 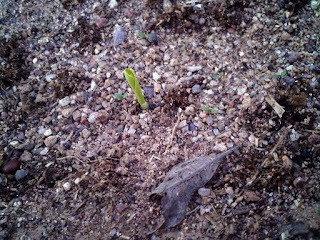 Today is one of the proudest days of my life, OK so not my life but I am pretty pleased that my corn has sprouted. It seems like all the kernels have sprouted they're about an inch a half tall. This is day 14. 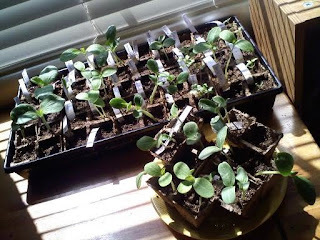 Also sprouting are items in the greenhouse, most things have sprouted and I already had to transplant some squash plants. Pretty soon most of the other sprouts will have to be transplanted as well, It's so nice to water something more than dirt. Also in a fit of craziness I have planted 100 pumpkin plants. I'm hoping to be that house on the front of the August issue of some home magazine. We'll see how that goes. I am also being given some plants by a friend who sprouted them but doesn't have room to plant them. On a side note we'll be getting some chicken and ducks the end of this month. Chickens help weed the garden and control bugs looking forward to the extra help. Day 1 of the garden happened on several different days, there was day one of the tiny terracotta pots from the Target Dollar Spot, Day 1 of the Jiffy brand greenhouse, and Day 1 of the actual dirt in my back yard. So we'll take them in that order. These were super easy and yielded pleasing success very quickly. I put my soil pellet in warm water and watched it grow (great for little kids or those of us who are not ashamed to shout about the simple things). Less easy but super fun. Jiffy is a brand and I recommend it from my short experience for the simple reason that the refills you can purchase for it come in the right size. So you can use it for next year or if you have plants that start later you won't have to buy two packages or have 3 extra of the peat pots. Only certain things can be sprouted inside and I'm not quite sure what the rules on but I will consult someone who knows more... When you're doing this (if you're not sharing packets of seeds with someone else as I was) you can just tear off the tops of the seed packets that have the names of the plants on them to label your pots. If not I, cut index cards into little strips. Just a note on picking seeds: I will pass down the great wisdom that my brother bestowed upon me in the Garden Center at Lowe's "When picking seeds pick something that you think is cool"
I'm growing purple beans, red corn and cucumbers that look like lemons. Why the Heck not? Sure it makes it harder to share with the neighbors (cause who wants alien produce) but I'm the one doing all the digging and work... scratch that, my brother-in-law is the one doing all the digging, but I told him where to do it. If you want a standard vegetable get your own relative to dig or try your local grocer they have plenty of normal things. This is the least fun day. It involves digging and squatting and pulling all sorts of weird things out of your yard. I'm pretty sure that there were children residing in our house at one point. Just to list a few of the things we found: Green Army Men (in whole and in part), a Female Scuba Diver Doll (or if it belonged to a boy it's an action figure), the biggest industrial size nut I have ever seen, glass of various sizes (apparently the kids parents gave them the same present my parents did at a young age - broken glass and a box of band aids), and my personal favorite (1) post for a clothes line which is still firmly cemented in the ground; I'm contemplating just making that an aisle instead of trying to dig it up. One recommendation for this day is to only dig up the part you intend to plant (a little gem from my mother-in-law). That way you feel like you have accomplished something more than making your yard look crappy. Let's face it, I had a yard covered in weeds and when it was just dug up it looked worse, at least the weeds were green. One other tip- Steer Manure - 97 cents a bag. 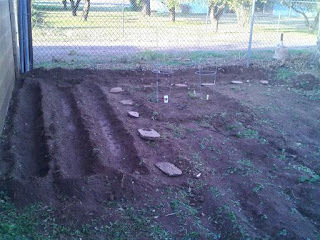 Below is the before and after pictures of Day 1 in the garden. The other locations don't get pictures because before and after is just empty pots and then pots with dirt. Note: These pictures are taken with my cell phone because I'm not dragging my nice camera outside with my dirt and manure covered hands. Thinking about that now maybe I shouldn't touch something I put right by my face with manure and dirt covered hands. 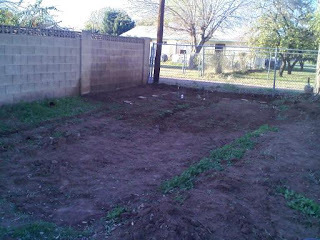 This is the Garden right after marking out the area (14' x 30'). 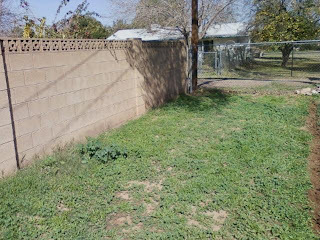 I'm using 1" x 2" posts with chicken wire to keep the dogs out. This is approximately 4 hours later with 4 people working. Here is a close up from the same time. Corn, beans and peas, and tomatoes so far.